Community: from the Latin communis, meaning common, public, general, shared by all or many. He renders this insight in a strikingly attentive, descriptive manner typical of the phenomenological tradition founded by Edmund Husserl. Merleau-Ponty shows us that language disappears, so to speak, when it succeeds in making its objects present to us. Bringing everyday occurrences to awareness—experiences so “ordinary” that they are lost in the pre-reflective flow of life which Husserl termed the “natural attitude”—exemplifies the phenomenological path of inquiry. Aloneness is what it is because it stands out to us upon the horizon of our remembered, anticipated, or imagined relations with others. We are always, in Heidegger’s words, “thrown;” we are in the world. For this reason in the Phenomenology of Perception Merleau-Ponty insists that “Truth does not ‘inhabit’ only ‘the inner man’, or more accurately, there is no inner man, man is in the world, and only in the world does he know himself” (p. xi). Phenomenological reflection is an awakening of previously mute experience, an achievement of consciousness that enriches the human community. The understanding we aim at is neither abstract nor merely academic, but thoroughly existential: in The Visible and the Invisible Merleau-Ponty writes that from a phenomenological perspective “to understand is to translate into disposable significations a meaning first held captive in the thing and in the world itself” (p. 36). The language of captivity and emancipation is not accidental. With greater awakening comes greater freedom: what is present to us stands out ever more clearly as what it is, and this frees us to more fully grasp and respond with integrity to others and to the situations we encounter. 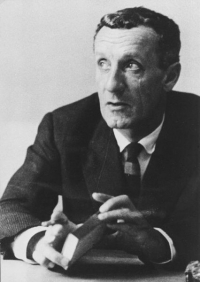 So Merleau-Ponty’s phenomenology has powerful ethical implications, particularly for those of us engaged in promoting inter-cultural, inter-ethnic, or interreligious understanding–even in a “postmodern” context characterized by profound skepticism about the possibility of transcending differences. So in Merleau-Ponty’s work we have an acknowledgment of the so-called “postmodern” situation in which we must fully acknowledge the ways in which our lives are situated, embedded in contexts that importantly shape our worldviews. As Terry Eagleton has pointed out, for many postmodernists this means we are locked in our own discursive worlds, we cannot bridge cultural differences, we cannot truly communicate across differences, and no ethical claims could possibly link us to the cultural other. So, Madison argues, “Merleau-Ponty’s ethics provides the basis for a politics of democratic, egalitarian praxis” (p. 182). Recent voices from Tahrir Square announce themselves as engaged in a struggle rooted in local realities while inspired by a “transcultural” conception of humanity that is the property of no single nation or culture. When I began studying Husserl and Merleau-Ponty with Amedeo Giorgi in the mid-90’s, he told me “Phenomenology isn’t just a philosophy—it is a way of seeing.” My aim here was to convey a taste of that way of seeing.